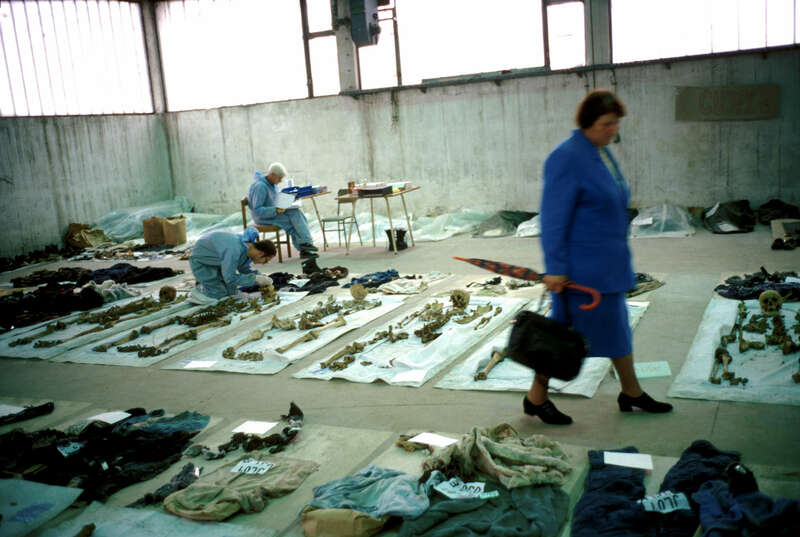 Aftermath: Bosnia's Long Road to Peace: Chapter Three: Love and Death: Viewing the exhumed remains of victims of \"ethnic cleansing\"
Viewing the exhumed remains of victims of \"ethnic cleansing\"
As forensic anthropologists Ewa Klonowski and Piotr Drukier work in the background, a woman walks among the rows of remains laid out with the clothing found with each skeleton during the exhumation of mass graves. Relatives looking for a loved one often recognize a piece of clothing first; a formal identification is made through forensic data and DNA samples. Thousands of Bosnians -- the majority of them Muslims -- remain missing years after the end of the war. October 2000.